This property management agreement is for the engagement of a professional commercial property management firm for an industrial park. The manager engaged by the agreement is responsible for the overall management of the industrial park as specified in the agreement. 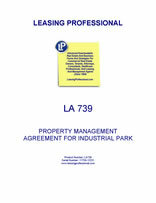 This Property Management Agreement (the “Agreement”) is made as of the 1st day of _________, 20___, between the undersigned INDUSTRIAL PARK OWNER, a __________ Limited Partnership (the "Owner") and the undersigned INDUSTRIAL PARK MANAGEMENT (the "Agent"). 1. APPOINTMENT AND ACCEPTANCE. The Owner appoints the Agent as exclusive agent for the management of the property described in Section 2 of this Agreement, and the Agent accepts the appointment, subject to the terms and conditions set forth in this Agreement. 2. DESCRIPTION OF THE INDUSTRIAL PARK. The Industrial Park to be managed by the Agent under this Agreement is an Industrial Park consisting of the land, buildings, and other improvements located in _________, _________ and known as UPSCALE FLEX PARK, containing ________ approximately square feet (the "Industrial Park"). The Industrial Park is more particularly described in Exhibit “A,” attached hereto and incorporated herein. 3. BASIC INFORMATION. The Agent will thoroughly familiarize itself with the character, location, construction, layout plan and operation of the Industrial Park, and especially the electrical, plumbing, air-conditioning and ventilating systems, and all other mechanical equipment. 4. MARKETING. The Agent will carry out the marketing activities designed to attract tenants as described below. a. The agent will show the Industrial Park to prospective tenants. b. A current list of prospective tenants will be maintained. c. The Agent will prepare all Industrial Park leases and, unless otherwise directed by Owner, will execute the same in its name, identifying itself thereon as agent for the Owner. Industrial Park leases will be substantially in the form attached hereto as Exhibit “B”. d. The Owner will furnish the Agent with rent schedules, showing contract rents for Industrial Park space, and other charges for facilities and services. The Agent will periodically review such rent schedules and make recommendations to the Owner with respect to changes thereto. e. The Agent will collect, deposit, and disburse security deposits, if required, in accordance with the terms of each tenant's lease. f. The Agent will perform periodic market surveys with respect to the market area in which the Industrial Park is located. 6. COLLECTION OF RENTS AND OTHER RECEIPTS. The Agent will collect, when due, all rents, charges and other amounts receivable for the Owner's account in connection with the management and operation of the Industrial Park. Such receipts will be deposited in an account, separate from all other accounts and funds, with a bank whose deposits are insured by the Federal Deposit Insurance Corporation. This account will be carried in the Owner's name and designated as the account of "UPSCALE FLEX PARK INDUSTRIAL PARK" (the "Industrial Park Rental Account"). Subject to compliance with Section 12 hereof, the Agent is, however, hereby authorized to make deposits to and withdrawals from the Industrial Park Rental Account as agent for the Owner. 7. ENFORCEMENT OF LEASES. The Agent will secure full compliance by each tenant with the terms of such tenant's lease. Voluntary compliance will be emphasized, but the Agent may lawfully terminate any tenancy when, in the Agent's judgment, sufficient cause (including, but not limited to, non-payment of rent) for such termination occurs under the terms of the tenant's lease. For this purpose, the Agent is hereby authorized to consult with legal counsel to be designated by the Owner, to bring actions for eviction against such tenants; provided, however, that the Agent shall keep the Owner informed concerning such actions and shall follow such instructions as the Owner may prescribe for the conduct of any such action. Subject to the Owner's approval, attorney fees and other necessary costs incurred in connection with such actions will be paid out of the Industrial Park Rental Account as Industrial Park expenses. 8. MAINTENANCE AND REPAIR. The Agent will maintain the Industrial Park in good repair, in compliance with local codes, and in a condition at all times acceptable to the Owner, including but not limited to cleaning, painting, decorating, plumbing, carpentry, grounds care, and such other maintenance, repair, remodeling and refurbishing work as may be necessary, subject to any limitations imposed by the Owner in addition to those contained herein. The Agent will also assist the Owner with respect to determination and implementation of capital improvements to the Industrial Park.